Home Uncategorized K.C. Mahindra all India Talent Scholarships 2015 for studying Diploma course. K.C. Mahindra all India Talent Scholarships 2015 for studying Diploma course. Are you going to study Diploma Course in India and want scholarship ? Don’t worry K.C. 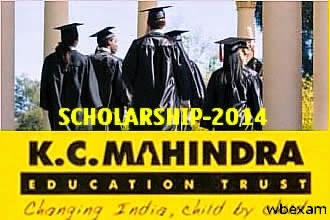 Mahindra Education Trust provide scholarships for doing Diploma course on Polytechnic. Students who passed standard X or XII on this year and took admission any recognised institution for Diploma course in Polytechnic, they can apply for K.C Mahindra Education Trust Scholarship 2015. Students from poor family can get facilities from this scholarship. Only Diploma course students are eligible for this scholarship scheme. KC Mahindra Scholarship 2016 Application Form and Eligibility, Click Here. For more details you may contact on this phone number, 033-66235700. The Application Letter must be received by authority within 30th July, 2015. No, application letter will be accepted after the last date. Scholarship authority will send the Application Form to the applied students through post. After received the Application Form candidates must fill it up correctly and send it with credentials on that previous address. Last date for received the filled Application Form is 15th August, 2015. Selected candidates will called for Interview. The date and venue will motion later. Some amount will be provided for visiting the Interview center. Scholarship will provide to the students after interview. Hello Rima, the last date for applying this scholarship was 30th July. So you cannot apply for this scholarship anymore. Ami aktu lata kre falachi,,asola ami jantam na..tai..ami ki ai nform ta r pata pari na sir??? Write a letter to the authority to the following address with requested for a application form. After receiving the letter they will send you the application form by post. Application from ta kothai sir..?? R ami ki ei scholarship ta pabo..?? That's really a great news. Interested candidates can also opt for diploma courses in game development. it is so helpful for poor people.